Android Nougat represents the 7th major version of Android, Google’s mobile Operating System. While terms like evolution are appropriate for this release, I think a different word is more appropriate. While there are some new features that make Nougat a worthy update, by-and-large it is safe to say that this version of Android is refining many of the features that made their appearance in Marshmallow. That, in my opinion, is a very good thing. Improvements in this release of Android come in various forms from UI updates to under-the-hood changes that make it perhaps the most refined version of the Operating System to date. My point is, if you are looking for massive changes between Marshmallow and Nougat, you may be disappointed. There are changes, to be sure, but not polar-shifting, orbit altering changes. More subtle changes… or refinements. banner you get after you update Android. Currently you get a banner that says “Optimizing app x of y” and depending on how many app you have installed, this can take upwards of 10 minutes. The reason is that Lollipop and Marshmallow use what is known as Ahead of Time compiling. This means that the OS compiles and optimizes any apps you have installed on your device prior to giving you access to it. The logic behind this is pretty straightforward: Once your phone has installed an update and optimized the apps, they all run at maximum efficiency as soon as you tap the app’s icon. But that comes at a cost. It means that in order for you to be able to use your phone after an update, this compiling has to happen. We can debate if you should update Android while in an airport… but that’s a different discussion. In Android Nougat, this has changed to a more hybrid model between Ahead of Time and Just in Time compiling. Just in Time, as the name hints at, brings you the ability to launch apps immediately after an update to Android – but at a cost. It will run slower initially until the compiling of the app is completed. Then things will return to normal. The logic behind this is straightforward too: If you have updated and then suddenly need to get to your boarding pass for your flight, you can get it quicker than waiting for Y number of apps to compile on your phone. After you have updated Android and your phone is sitting idle, then the OS uses the Ahead of Time process to optimize apps that you haven’t accessed in the background. It is a really elegant solution. Another interesting side effect of using Just in Time compiling is that apps that are newly installed will install and be available much faster than they are in Lollipop or Marshmallow, but they will run a it slower the first time you run them. My experience with suggests that this too is a double-edged sword. Yes you can get to that app faster but it will run slower until the compiling is complete. That’s no big deal on say Google Docs or Microsoft Word. On Real Racing 3 however? The only problem is that this new startup optimization is forward looking. Current devices are not going to be able to take advantage of it, including the current lineup of Nexus devices. The reason is the way that these devices are partitioned by Android. I’m sure that some enterprising XDA developer could get around this but out-of-the-box, this won’t work on your current phone after you upgrade to Nougat. One of the first things you will notice when you start using Android Nougat is the much improved Notification shade. 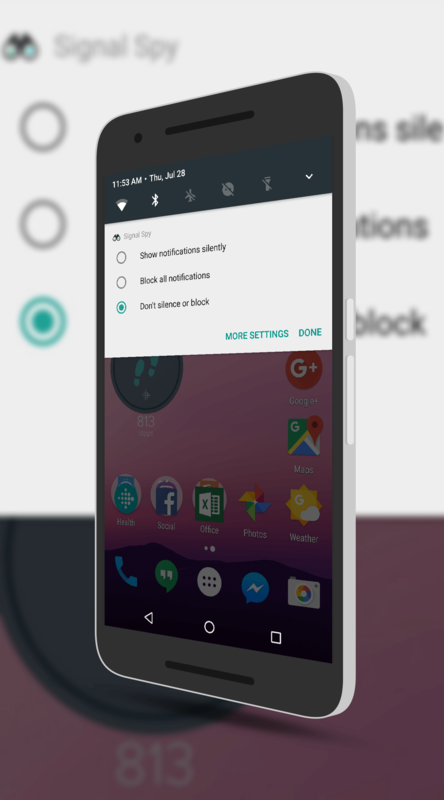 In Android Marshmallow and Lollipop before it, the Notification Shade was reasonably productive in that it provided you an easy way to get app notifications. The challenge however came when you received multiple notifications from the same app. Some apps would lump them together (like Google+) while others would simply give you a stream of notifications (MLB at Bat for example). In Nougat, this changes. Now all notifications are lumped together by app, taking up far less real estate when you are reviewing your notifications on your Lock screen. In Nougat, you will see all of your multiple notifications for a single app as one block. Tapping that will open up those notifications so you can read them individually and dismiss them individually. This gives you the option to keep some notifications visible, like for email as an example. 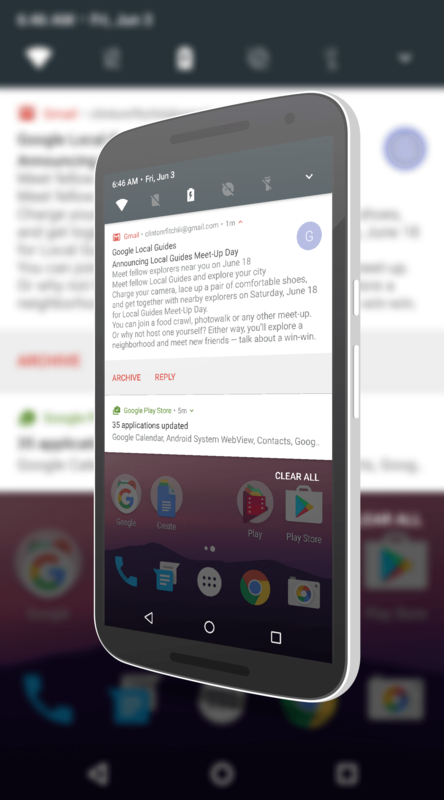 The second thing you will notice about the new Notification Shade is the seamless view of notifications within it. In Marshmallow, there was a small gap between each notification. Now they will appear seamless with no gap between them. 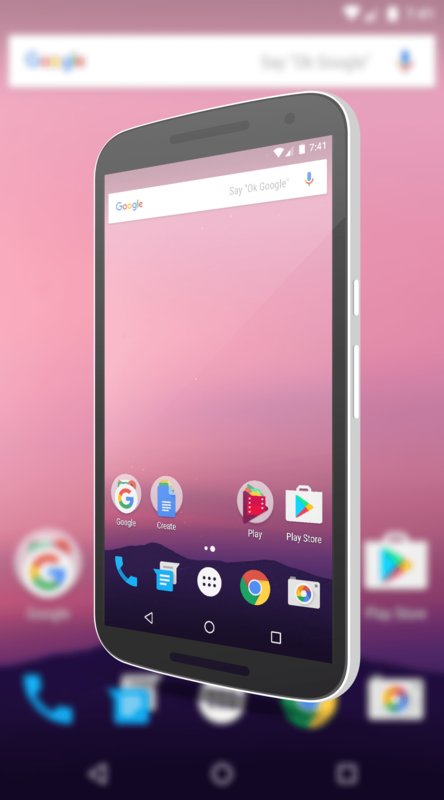 It’s really more of an aesthetics issue than anything but it certainly look better than it did in Marshmallow. Additionally, there is the ability to customize the look of you the Notification shade widgets at the top of the screen. In Marshmallow you could do this but you had to enable the System UI Tuner in Settings. N essentially brings this ability to you out-of-the-box without having to do any modifications in settings. Now you can have those key features that are most important to you on the shade and remove those that are not. Related to this is the ability to change notifications for specific apps from within the Notification shade. Previously, this was something that was done in Settings under Apps and it was a binary setting: Either it was on and you got everything or it was off and got nothing. Now you can be a little more selective. While this still isn’t a huge amount of control, it is a little and more importantly, you don’t have to dumpster dive into Settings to change the behavior unless you completely block the notifications (which you would have to re-enable in Settings under Apps). Another big change in Android Nougat is the ability to adjust the urgency of notification. In Android Marshmallow, you can you somewhat have a binary decision when it came to notifications. They were either on or off with a few tweaks on what apps would give you a notification on the screen or be hidden from view. There wasn’t a lot of flexibility in the system. Nougat changes that with an option you can find in System Tuner. This new Power Notifications Controls are found under Other in the System Tuner and give you six degrees of control over notifications. Accessing System Tuner in Nougat is identical to the process in Marshmallow. Slide the notification shade all the way down on your phone then tap and hold the Setting gear icon. After a few seconds it will shake and you will see a pop-up letting you know you have accessed System Tuner. From there, go to Settings, scroll all the way down and just about About Phone you should see System Tuner. Tap it then tap on Other. There you will see the Power Notifications Controls. Tap that area and you can enable the feature. 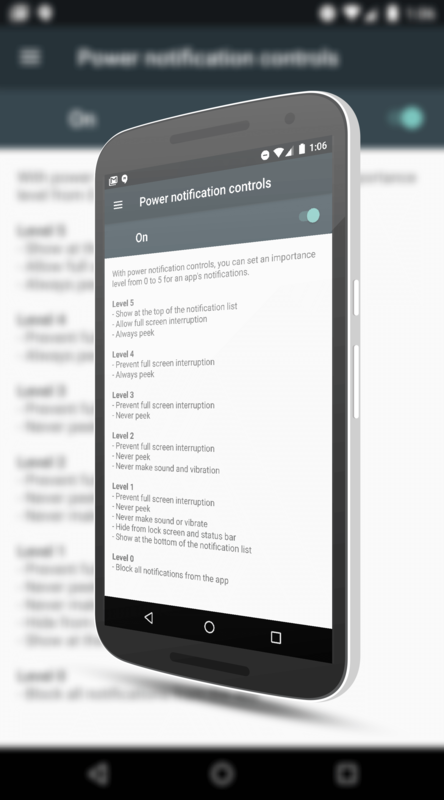 By default, every app on your phone is going to automatically be configured for the level of notifications that it would have had under Marshmallow. You, however, can control that now. Let’s say you always want Hangouts to interrupt anything you are doing on your device and always provide you high levels of notifications. Now you can give Hangouts a Level 5 access so it will always give you notifications no matter what is going on. To do this, you need to go to Apps in Settings then scroll down to the app you want to adjust. Tap it then tap on Permissions. You’ll note that there is a star icon with an “A” in it. That means it is set to automatic. Tap it and then use the slider to adjust the level of notifications you want for that app. Once you are done, exit your way out and you are good-to-go. While the Settings menu in Marshmallow was well organized, Google has taken it a step further with Nougat. First is the side swipe menu. If you swipe from the left edge of your device, you will get a menu that allows you to quickly get to any setting on your phone quickly. 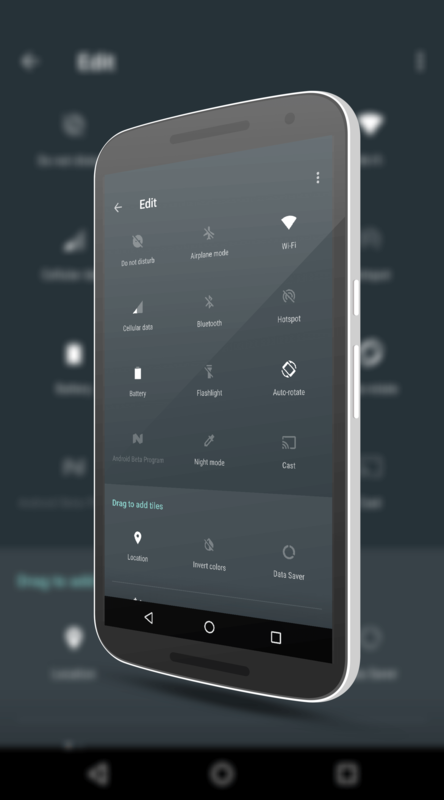 It is easy to operate one handed, something that you couldn’t do very easily in Marshmallow. The second new feature is suggestions. This is at the top of the display in Settings and gives you suggested settings to adjust or change to make your experience more personal or productive. One of the early changes that was notices in Nougat was around Doze, the battery saving element in the Operating System. As many of you will know, Doze made its appearance in Android Marshmallow and while it is really good and really impressive, it does have some rough edges. It appears that Google is working to address those in N and from what I am seeing, they are all positive steps. It has to be running on battery power (not plugged into AC) meet certain criteria. But what if you are walking around all day with the phone in your pocket? That, my friends, is the rub. In that scenario today, Doze won’t kick in. Let’s say you are walking around a convention center like I have been doing most of this week with your phone in your pocket. While you save some battery by not having the screen on as it is in your pocket, other services like Wi-Fi and notifications are still blazing away, eating up battery. This, fundamentally, is how Doze has changed in Android Nougat. Within this new release of Android, there are a couple of key things that have changed. First, when the device has its screen off and is in your pocket, a subset of Doze features enable to save you battery life. What happens is it turns off network access and notifications for periods of time, then wakes up, checks everything out and gets any updates, then goes back into this semi-Doze mode. If however the device is indeed sitting still, it goes into full-on Doze mode. Today, in Marshmallow, Doze is either an all-in or an all-out proposition. These new staged levels of Doze in Android Nougat are great because they solve (at least partially) the issue of not really saving any battery while you have the device sitting idle in your pocket or bag. It may sound a little harsh but reality is reality. The Android experience on tablets has been, well, sucky. and-large and that means that apps, especially under KitKat and Lollipop were ugly at best on Android tablets. Marshmallow improved things a lot and developers were also developing tablet versions of apps which helped at the same time. The other big issues was productivity. Although you have more screen real estate on a tablet, Android was never really able to take full advantage of it. You could only view one app at a time which meant you were constantly having to use the Recent button on your table to navigate between apps. Productivity, which better than on a phone, was still hamstrung when it came to reaching its full potential. If there is a banner feature that represents the entire Android Nougat release, it is split screen viewing. Google, in this case, is very much catching up to Apple’s iOS for iPads as those devices have had the ability to view two apps at once for about a year now. However, what Google has done is fully and properly implemented this for tablets and phones that truly makes productivity much easier than it ever has been on an Android powered tablet. 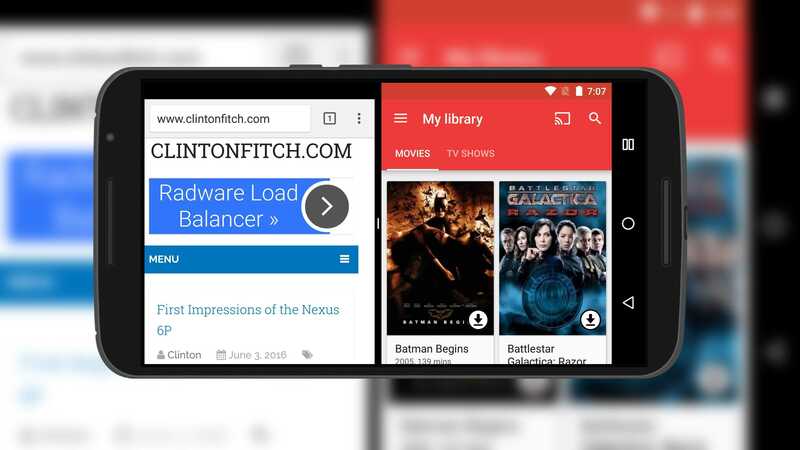 On an Android device, you can now select which apps you want to have open and can even resize the split screen to maximize your productivity. If you want to switch out an app, you can do so easily and each side of the split works independent of each other. In other words, you can change out the app on the left side while keeping whatever app you have running on the right side going. You can also copy and paste from each side of the screen. Where Google really makes Nougat sing however is the leveraging of the recents button on the tablet to quickly flip between apps. Again, keeping each side independent, you can easily scroll through your open apps running in the background just by tapping the recents button in split screen mode. This is a huge productivity gain for users who need to work on 3 or 4 apps at a time. There was a time, in the not-to-distant-past, where being visually impaired made using a smartphone or even a PC challenging. While huge strides have been made on the PC front, the accessibility changes needed on smartphones to help those with vision challenges have been slow to come. It has improved significantly as both Google and Apple focus on this with their platforms, but there is always room for improvement. Within Android Nougat, those improvements are come in a positive way. This is quite a bit different than the larger text feature that has been in Android for some time. That feature only made text and a few other elements on the screen larger but things like the navigation button remained their regular size. Nougat changes that and it is certainly for the better. The second big change is after setup and you access Accessibility in the Settings menu. 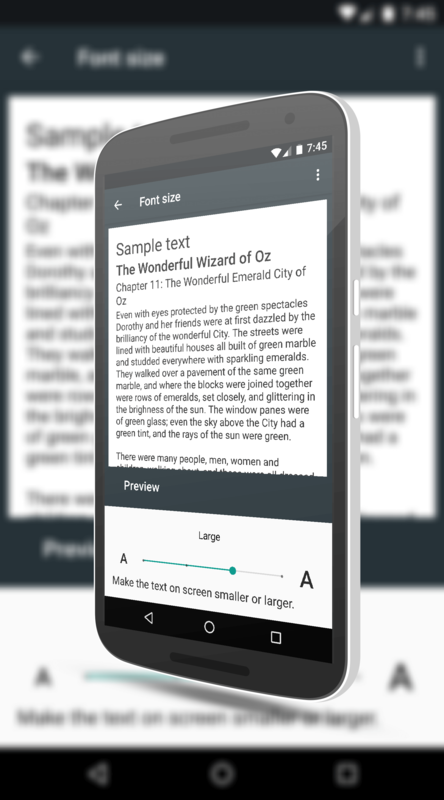 While in Marshmallow you had the ability to use larger text and enable triple-tap zooming, you were basically only enlarging the text. In Nougat, this changes. It actually changes the screen DPI so everything is larger (or smaller) including things like the navigation keys and the System information at the top of the display. This should make the user experience more uniform for those who need the visual aids. The good news is that the way this is implemented, most apps should be compatible with this new functionality Day One. Data Usage and restrict apps from using data, it is again an all or nothing. That appears to be changing in Android Nougat. 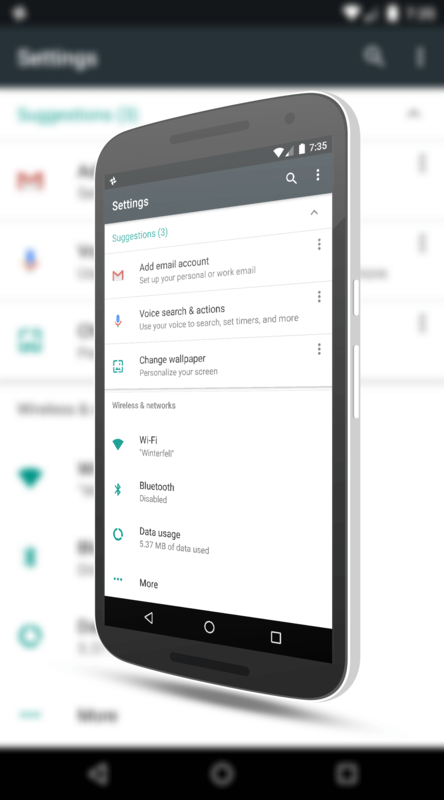 Under Settings>Data Usage, there is a new option for Data Saver. When this is enabled, you can then select which apps have access to cellular data and which ones don’t with a simple white list-style approach. No more having to go into each and every app. You have a simple screen with all your apps that you can use a toggle to indicate that app will have unrestricted network access. If it isn’t enabled, it doesn’t get access. It is clean and simple. Further, if you have Data Saver enabled, the apps that you have white listed are allowed to go full-bore on your data plan. They are still instructed to use less data and this is something Android controls. 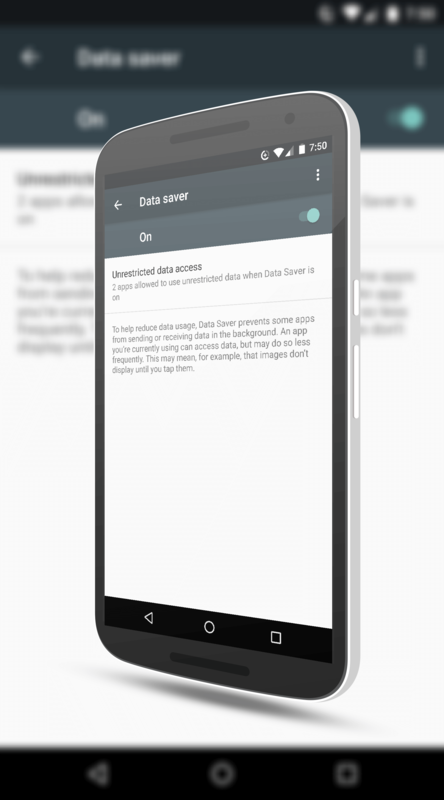 So think of it this way: If you enable Data Saver on your device running Android Nougat and are on cellular data, the only app that will have unrestricted access by default is Google Play Services (which as I described, is somewhat of a “glue” app between your phone and Google – it’s important it have access to things) so no more background data checking. The only way an app can use background data is if you have allowed it on this approved list in the settings. Emoji are a big part of how people communicate with each other with their phones. They communicate thoughts, feelings, and activities without having to type them all out. Unicode 9 brings a whole new set of more human like emjoi to the mobile space and Android Nougat has certainly picked it up. These new emoji convey not only different races of humans through changes in skin tones, but also different ages of humans and a plethora of new activities. There are also new drink and cocktail emoji, new food emoji and new activies to use. 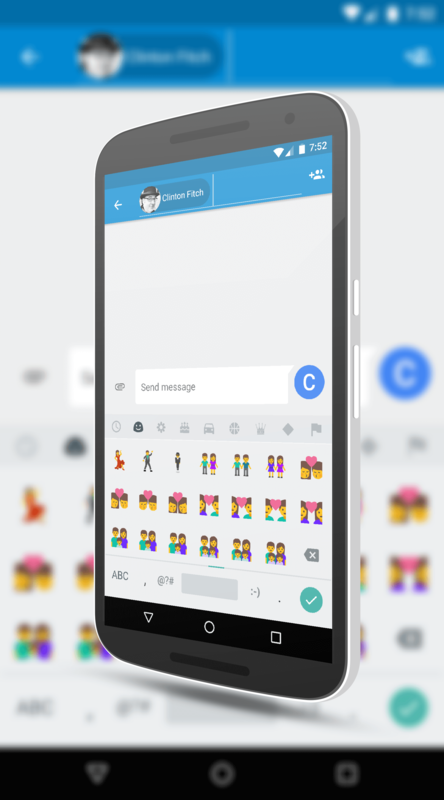 blobby emoji are still there but you have a whole pile of new ones to explore in Android Nougat. User profiles in Android are one of those things that few people use but that doesn’t mean that the Android team didn’t find a way to improve them in Nougat. For those who aren’t familiar, User profiles allow you to have different users use the same device. Let say you want to have a profile for the kids and one for yourself that has different apps installed. It is a pretty cool feature but just not something most people need. and fill out the information such as your name, age, address, blood type, known allergies, etc. You can also associate a contact for someone to call which again, can be accessed from the Emergency dialer. tap on EMERGENCY at the bottom of the dialer. 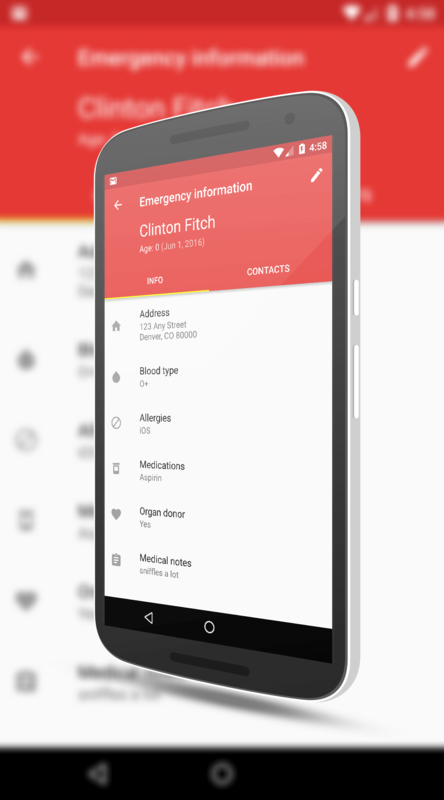 Next, at the top of the dialer, tap on the Emergency Information button at the top twice. This displays all of the information that you entered in for an emergency worker to access. Likewise, they can swipe over to the designated contacts and call them. The idea of course is to give responders quick access to information about you in a situation where you could not answer them or are unable to answer them. This can save precious seconds which could make a difference in your recovery or health. It is a simple but effective change and I’m glad to see Android add this to what to this point has been a somewhat useless function in the OS. Google Play Books at the beginning of the year introduced a Night Mode. The idea of this was to gradually turn your screen more warm (yellowish) to make it easier on your eyes as the room darkened around you. With Android Nougat, Google has introduced a new system wide Night Mode. This isn’t quite as granular as the Night mode in Google Play Books in that it is either on or it is off, but it works well and it certainly makes viewing your screen in low light situations for long periods of time much easier on your eyes. Night mode is activated by pulling down the Notification shade and tapping the Night mode icon. Your phone is instantly changed to the more yellowish, warm tones of the mode and will stay in this mode until you turn it back off. Since this is a system wide change, it works on any app. That means if you are reading a Google Doc file or simply surfing around in Chrome, there is nothing special you need to do. One note of interest on this feature is that it only appears to be on Android phones and not tablets. With Android Marshmallow, the ability to setup Do Not Disturb for events was there but it was less than intuitive. At best. Google seems to have realized this and done a bit of refinement work around DND on events. The first step in this was bringing these to the main Do Not Disturb page as a template. This was not the case with Marshmallow and frankly, I suspect a lot of people missed out on this option because they simply did not know it was available. Setting up Do Not Disturb is done in Settings>Sounds & notification>Do not disturb on your phone or tablet. 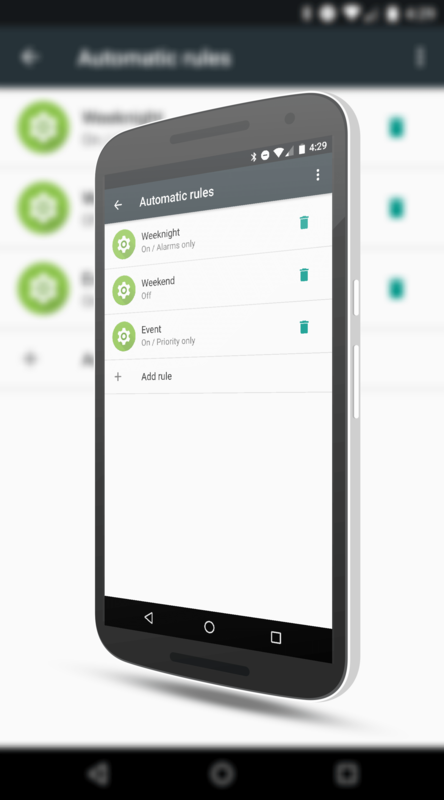 Under the Automatic rules section, you will now see an Event template. You can use this template to create your rule which can be based on particular calendars (or all of them) and be dependent upon how you replied to that event: Yes, Maybe or Not replied. You can then set which notifications, if any, are allowed through regardless of the rule. So for example, I have an event rule setup where if I have replied Yes to any event on any calendar, my phone goes into DND for that event. Further, I have setup the rule where if my wife sends me a text message, I get that message but nobody else can get through. For me, it creates a distraction free meeting or work time where I do not want to be disturbed. 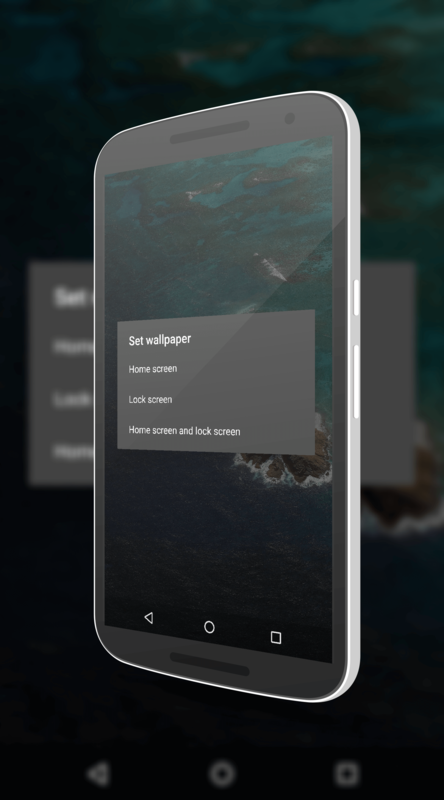 Another new feature of Android Nougat that is a bit of a catch-up item is the ability to have different wallpapers for the Lock screen and your Home screen. This is something that iOS has been able to do for a while now as has Windows Phone. The idea of course is to give you just one more level of customization and personalization of your device. settings then tap on Wallpaper. Scroll through to find the photo you want as your wallpaper, tap it then tap the check mark in the upper-left corner to select it. In Android Nougat, you will be prompted to select if you want this wallpaper for your Lock screen, Home screen or both. Select the one you want and that’s it. Nothing super fancy or special here but for those who like to have different wallpapers for these two screens, your wish has been granted. Another small but somewhat important change within the settings of Android Nougat is the new sections for Memory and Storage. The sections themselves are nothing new. They have been there since the Gingerbread days. What is new however is they within the Settings page you now see how much memory and storage is consumed without actually having to open up that part of settings within Nougat. This, of course, saves you a few screen taps but also gives you the information you need at a glance. Android is pretty good about managing RAM (but not perfect) and this quick glance can give you an idea of what is consuming the most amount of RAM on your phone or tablet over the previous 3 hours. Like many parts of the Settings in Nougat, this new tidbit of information is more of a refinement than a new feature. One of the things that Nougat will support more out-of-the-box will be VR. Google went out of their way at Google I/O in May to outline this new support and while some of the Nexus devices that will get the Nougat update won’t be able to take full advantage of it, the fact that from the ground up this build of Android supports VR bodes well for the future. Within the release there are indicators of which apps will take advantage of the native VR support. If you navigate to Settings>Apps then tap on the gear icon to open up Configure app. Now go to the bottom of the page and tap Special access. This will open up a page that will be familiar to most. Here is where you can set app to have draw over access, Battery optimization and device administration. Note there is a new section, VR helper services. 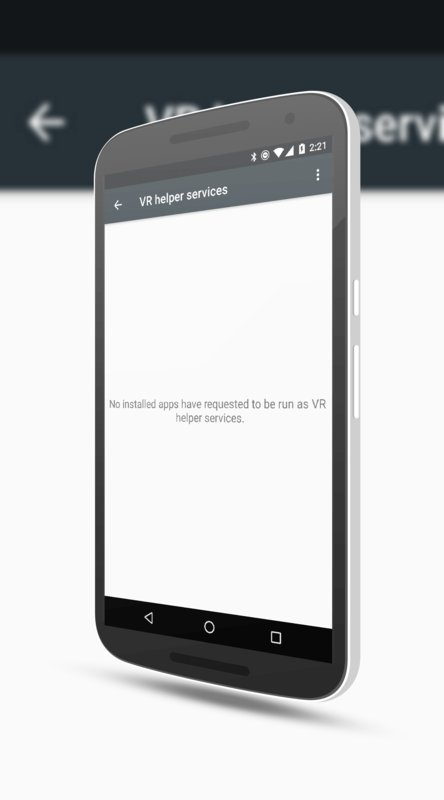 In this section you will find all of the apps that have requested VR support from Android to run. and developers will likely want to take advantage of these new APIs sooner rather than later. For us users, that’s a plus as we won’t have to wait long. From a rendering and gaming perspective, perhaps the best news with Android Nougat is the native support for Vulkan. Vulkan is the next generation of 3D rendering API from Khronos Group, one of the key groups that created the OpenGL graphics standard that has been used heavily to this point. The idea behind Vulkan is to give a lower CPU and memory overhead requirement to the API, which translates into faster gaming and general video performance on devices. Further, the API is cross platform so it works on Windows, MacOS and now Android. It is a big step forward that, while most will not care to understand all the details, they will benefit from it being on their device. The key in the use of Vulkan will be the adoption of the API from developers. They will have to use it in their games and apps in order for it to be taken advantage of in Android Nougat. That, frankly, should happen pretty fast. While there likely won’t be a huge rush by developers to retrofit games in the Play Store today, games slated for later this year will almost certainly take advantage of it to improve performance and stability. Much like the support for Unicode 9.0, the fact that Vulkan is supported in Nougat is a bit of future proofing by Google. Nougat won’t come out of the gates already behind which, given the speed at which development happens, is pretty impressive. 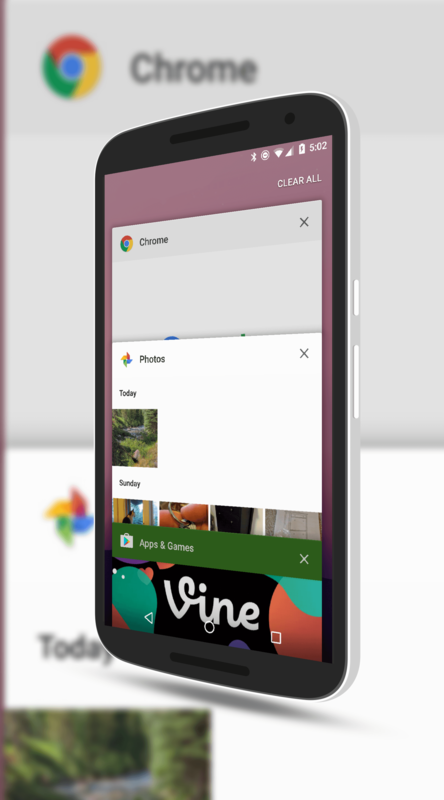 Close All Apps With A Single Tap – Finally! you can swipe down and you will see a Close All feature. Tap it and all of your apps are closed. No more swiping and sliding to kill off apps. One tap and you are done. This is a small feature admittedly but one that Android users have been wanting to see for a long time. Nougat, finally, has it. The Recent button in Android, to this point, hasn’t been super useful. Yes it takes you to your list of recent apps… and that’s about it. This, fortunately, changes for the better in Nougat. While the functionality of viewing your open apps is still there, there are two new key functions in the Recent button that allows you to take advantage of some of the new features in the release. First, if you tap-and-hold the Recent button, you will enable the split screen feature that I highlighted earlier in the review. To do this, have an app open on your phone or tablet, then tap-and-hold to see the other apps you have running. Scroll through the list, find the app you want to use and tap it. The other new feature is to double-tap the Recent button to go to the app you were running prior to the one you are currently viewing. Using this new double-tap feature allows you to quickly switch between apps that you have open when you don’t want to go into split screen mode or, while you are in that mode, switch apps in the lower (portrait) or right side (landscape) of the screen. Like many new things in Android Nougat, this improvement around the Recent button is a refinement of what has always been the platform and, in some cases, is a catch up to iOS. Regardless of how you view these changes, they are positive steps in the right direction and they certainly make the recents button far more useful than it has been in previous releases of Android. A new feature that as much to do with Nougat as it does with the camera app itself is a new flick gesture that allows switching between the front and rear cameras. In Marshmallow and previous Android releases, in order to switch from the rear main camera to the front facing selfie camera, you had to toggle it in some way – usually by tapping a button within the camera app itself. In Nougat, you can still do that but if you flick your wrist while holding your phone, it will automatically switch from one to the other. So if you want to capture that landscape shot then quickly take a selfie with that landscape in the background, you can do it easily and one handed. This is possible as the new camera app in Nougat uses the accelerometers that are built into the phone and in my testing of the feature, it is actually pretty smart. You have to give a distinctive left-right or right-left swivel of your phone in your hand to make the switch happen. Moving the phone up or down or even slightly side-to-side won’t trigger the change. That means that you have less of a chance of accidentally switching cameras while you are walking or in a car (as a passenger!) taking photos. I’ve been fortunate enough to be using Android Nougat since Developer Preview 2 on my Nexus 6 and have been running it full time on my Nexus 6P and Nexus 9 since Developer Preview 4. Despite it being in beta, it has been solid, especially DP 4 and 5. It has the look and feel of Marshmallow but it has some refinements and improvements that I think most users will appreciate. As I put in my opening comments, Nougat is not going to be revolutionary. This is not the jump from say KitKat to Lollipop or even Lollipop to Marshmallow. It is an incremental step that smooths out rough edges and brings nice improvements. HTC has committed to having the Nougat update out for the One M9 and HTC 10 this year and of all the manufactures, they have been the most transparent about getting the update out. Samsung has also committed that the Galaxy S7 lineup and Note 7 will get it as has Huawei on the Honor 8. The wildcard of course will be those devices locked into carriers which take notoriously longer than the manufactures to get updates out. The bottom line folks is it could be weeks or months before your device sees it. I can only suggest you keep putting social pressure on your carrier and manufacture to get the update out quick. You will like Android Nougat.